No matter where you live, there are four seasons: spring, summer, autumn, and winter. In terms of fresh produce, though, there are more and nuanced seasons we await every year with mouthwatering anticipation. The seasons for tomatoes, melons, strawberries, okra, squash, citrus, leafy greens. And, of course, asparagus. In Germany, this particular season has a name: Spargelzeit. It really just means “asparagus time” but it sounds so poetic in German. And white asparagus time is the most special time of all. Today’s recipe is very simple and provided us with a very special lunch one Sunday afternoon. It can easily be made with green asparagus and regular butter instead of the truffle butter. I simply had some really flavorful truffle butter from my friends Pauline and Alex in Switzerland, and thought this was a nice way to use it. Bring a saucepan of lightly salted water to boil. Trim the asparagus and peel it, leaving the tips and about 1 inch unpeeled. Reserve the peels. Place the asparagus in the boiling water, reduce heat and simmer for 7 minutes. 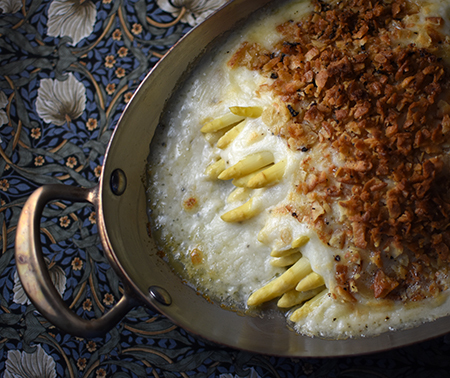 While the asparagus is cooking, grease a gratin dish liberally with butter. When the asparagus is done, drain and arrange in the gratin dish. Set aside. 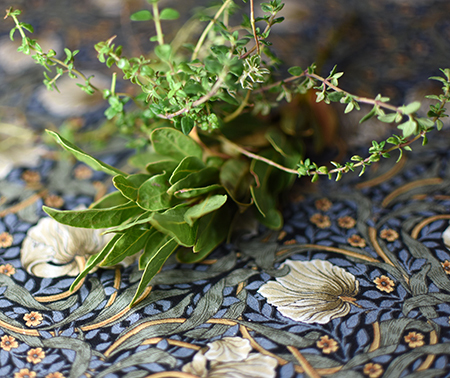 Place asparagus peels, thyme, and bay leaves in a small saucepan. Add milk, bring to a boil, then remove from heat and set aside to steep for 10 minutes. In a medium saucepan, melt butter over medium heat. Add the flour and cook for 1 minute. 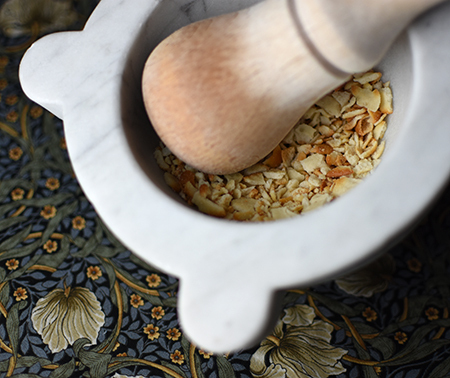 Strain the herbed milk into the butter and flour mixture, and cook over medium heat until béchamel sauce is thick. Season with salt and pepper, and stir in Parmigiano-Reggiano. Pour the béchamel over the asparagus. 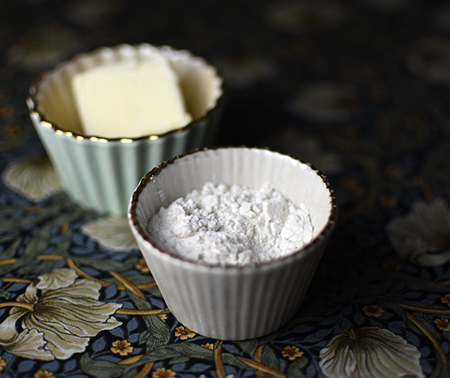 Melt the truffle butter in a small skillet; crush the cracker crumbs and add to the butter. Season well with pepper. 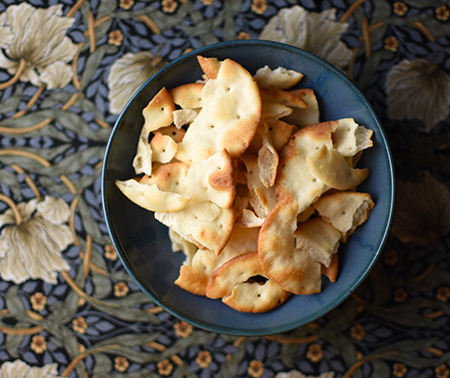 Cook a minute or two, until the cracker crumbs take on some color. Sprinkle them over the béchamel sauce, and bake for 20 minutes until bubbling and golden. Serves 2 as a main course, or 4 as a side dish. David, white asparagus is my all time favorite. I am going to Germany next week and will indulge in Spargelzeit. Your recipe looks wonderful. I will have to try it. Have a wonderful trip, Gerlinde! Eat lots of white asparagus for me! Beautiful dish, David. I look forward to making asparagus recipes in the Spring too and your gratin looks rich and absolutely delicious! Thanks, Marcelle. Ot was definitely rich, but oh so good! Gorgeous. I, too, love white asparagus and happen to have some truffle butter! The temperature is not supposed to rise about 28 degrees today--I would sure love a little spring like this on my table! Maybe this will conjure spring for you in New England, Susan? Kind of like witchcraft but more like vegcraft! Mmmm! Spargelzeit is almost here! Your dish looks delicious David and I love your pan! Thanks - I think it’s a beautiful season! I'd happily devour this on its own, especially with the truffle butter. Asparagus is so abundant here right now, though the white variety is a little elusive. And thanks for introducing me to the term Spargelzeit! Loved your use of the Weißspargel, Greg... literally, a work of art! Es Freud mir! Spring is the best! Love your variations, Stefano! Hope veggie season arrives soon. Wow what a perfect seasonal dish, I love all these spring flavours together. You do bring smiles and memories :) ! Having had to visit the Hannover-Messe for decades, methinks the main reason I did not pass that 'duty' on others was to live on 'Spargel' for a glorious fortnight! Must try your recipe when spring again arrives in Australia . . . am more used to the wonderful stalks married to Westphalian ham!!! As I wrote this, Eha, I was feeling bad fro my "south of the equator" friends who won't get fresh Spargel for quite a while... Worth waiting for, eh? Wow, David! This sounds like such a wonderful way to serve asparagus. Although green asparagus from Mexico is starting to make its way to our produce aisles, we're still weeks away from seeing its white siblings. Thanks to you, I'll have a special way to welcome them. It has been a tough winter, John - I hope t ends soon so you can be nibbling the tender shoots of locally grown green and white asparagus! 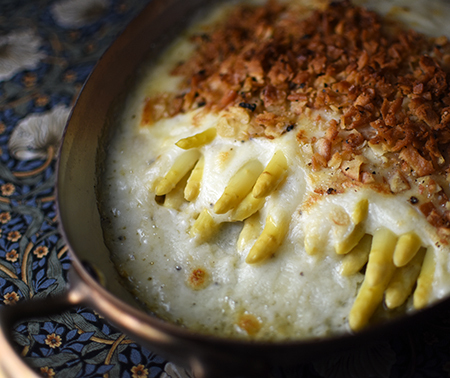 This is such a great way to use this white asparagus, not long until it's in season over here! I am so happy spring is on its way to you, Caroline! Enjoy! Yes I've been in Germany for Spargelzeit. Your recipe sounds like a really delicious one that I'll have to try when I see white asparagus in the market. I need to try this with green asparagus, too, Karen - I wonder if it will taste as special! Guess what? I don't like asparagus! 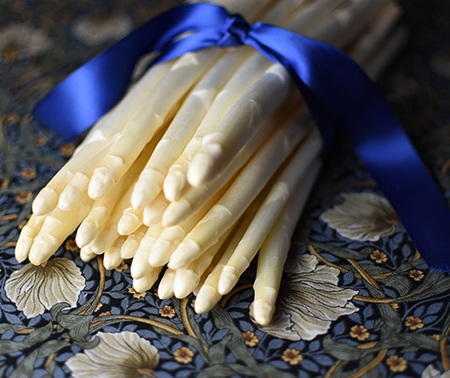 However, I discovered two years ago on an AmaWaterways cruise (their cuisine is impeccable) that I love white asparagus! The truffle in this is making me swoon! I can just imagine how delicious these are! I had a feeling that was coming! :) Yes you DO like white asparagus?? Go figure! Glad you like the post, Christina!